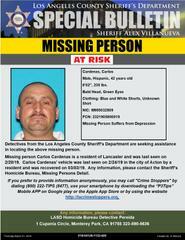 #LASD Missing Persons Unit detectives are seeking the public’s assistance in locating Carlos Cardenas, a 42-year-old male Hispanic who was last seen on Wednesday, February 20, 2019. 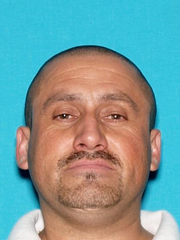 Mr. Cardenas is described as 6’2”, 230 lbs., bald head and green eyes. He was last seen wearing blue, and white shorts and an unknown shirt. Mr. Cardenas’ vehicle was last seen on Sunday, February 24, 2019 in the city of Acton and recovered on Sunday, March 3rd, 2019. Mr. Cardenas suffers from depression, and his loved ones are asking for the public’s assistance in locating him.